Rovio Entertainment Ltd. said its new game “Angry Birds 2” hit 10 million downloads just days after its release, much faster than the company expected. But not all players are happy with the franchise’s embrace of in-app purchases. The “sequel”—actually, more than a dozen games featuring the birds and their egg-thieving pig foes have been released—sits atop the chart for free downloads on Apple ’s App Store in the U.S. The game is No. 2 on the Google Play chart for free Android apps in the U.S., behind Facebook ’s Messenger. “Our goal was about 10 million for the first month,” says Eric Seufert, vice president of user acquisition and network engagement. But one new facet of the game is ruffling feathers. Players who exhaust a limited number of “lives” must either wait 30 minutes or complete an in-app transaction for more. They can spend money on digital currency or spend time watching an advertisement. The first three Angry Birds reviews on Apple’s App Store trash the deal. “Disappointing,” one says. Another reminds would-be downloaders of a time when you could spend 99 cents on Angry Birds and play tough levels over and over “with no worries.” Reviews in the Google Play store echoed the same theme. 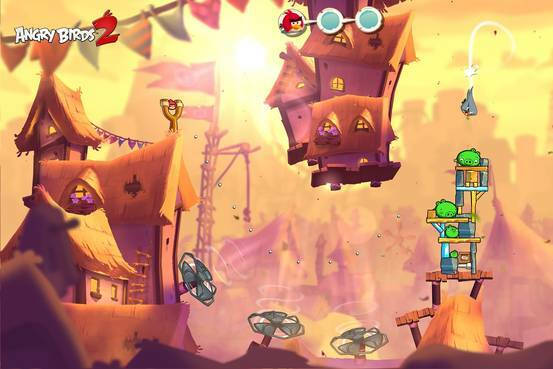 Most Angry Birds fans grew up on 99-cent downloads and unlimited chances to defeat the greedy pig foes. But Rovio left that approach behind more than a year ago, Mr. Seufert says. There are lots of places where smartphone penetration is high and 99 cents is unaffordable, he says. If people don’t pay, they can still enjoy a triple-A, fully formed game, he says. Three of the top five of Apple’s “top grossing” apps are games with such in-app purchases: Supercell Oy’s “Clash of Clans,” Machine Zone Inc.’s “Game of War: Fire Age” and King Digital Entertainment ’s “Candy Crush Saga.” They are the holy trinity of mobile-game spending and they have sat atop that chart for a long, long time. This is the new reality for mobile gaming. As the WSJ’s Sarah Needleman wrote in May, mobile game makers are trying to entice spenders with games that are free to play. Once inside, gamers can spend on extra lives, upgrades and other perks. Only a small group does so. An even smaller slice of gamers—affectionately called “whales” after the casino term for big-spending gamblers—drops $50 to $100 a month. Currently, Angry Birds is No. 45 and climbing on Apple’s top-grossing chart. That’s extraordinary, Mr. Seufert says, since it usually takes players days before deciding to invest in an in-app purchase. Plus, he says, the ranking doesn’t include money earned from advertising, which is one of the ways Angry Birds players can earn free lives. If it did, Angry Birds 2 would be higher, he says. “The market has evolved,” says Mr. Seufert, who has written a book about “freemium” economics in software. “Free-to-play dominates mobile gaming and it dominates mobile.” There’s likely not a future in the mobile ecosystem for paid games at the scale of Angry Birds, he says.